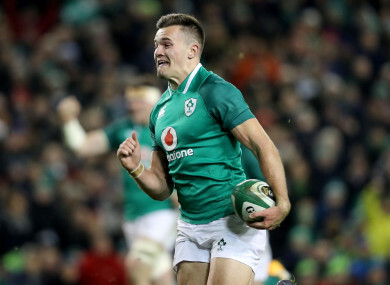 YOU WOULD FORGIVE Jacob Stockdale for having a high opinion of himself. After all, he has been the talk of nearly every Irish rugby writer for the last two months. Nine tries from nine games this season, a breakthrough into the national set-up and the winning score against Harlequins at a snowy Stoop last weekend is just the latest in his exploits since August. It’s worth remembering that a year and a half ago he was still an Academy player with Ulster, looking to make the most of whatever minutes he could get on the pitch in an extremely talented back line. Now he’s one of the first names on the teamsheet for both club and country. And yet the 21-year old has a wise head on young shoulders. A visit this week to his old college, Wallace High, shows he hasn’t forgotten where he comes from, while he also holds an ambassadorial role with local junior team the Lurgan Tigers. “It’s been great so far,” Stockdale says of his impact on the Tigers. “My role is whatever the club need me to do, if I have time and it’s not too much, then I’m more than happy to do it. In fact, speaking to the fresh-faced winger – who will line up in that same position against Quins again tonight in the second of the back-to-back Champions Cup games – you wouldn’t think he was the same person who received so many plaudits for his performances over the autumn. Tries against the Springboks and Argentina, and two more all-round outstanding performances, only served to underline his remarkable rise and solidify his place in that green No.11 jersey. At the conclusion of the international break, all eyes were firmly on him after an eye-catching November. Gone were the questions over whether he could make it on the international stage, this kid was for real. You’d think he’d be playing into that hype. Not at all. “I think it’s easy to get caught up in how good you’re playing, or how successful you’re being, but one bad game can turn that round and you’ll have people saying ‘oh, maybe he isn’t as good as we thought he was’,” he explains. “You have to take everything with a pinch of salt. It’s only good performances that can create a bit of a buzz, it’s just working hard to get those performances. Ironically, Stockdale is still wearing an Ulster Academy shirt while doing his media duties – not a ploy to keep him grounded, he claims, but rather a clothing mix-up at the house he shares with Academy trio Adam McBurney, Jack Regan and Marcus Rea. Instead he has progressed well beyond an Academy hopeful into arguably Ulster’s most dangerous player – a high accolade in a team that contains superstar All Black Charles Piutau, such has been his effectiveness for Les Kiss’ side. At just 21 his career is still stretching out ahead of him, but Stockdale already sees himself as one of the players within the squad who should be pushing others on despite his youth. “I feel very comfortable with all the guys. If I try to drive to standards and stuff, I don’t think they’d be going, ‘what’s this 21-year old doing, he’s only just here?’” he believes. This week is another chance to impress on Europe’s biggest stage as Harlequins roll into Belfast for the return leg of their back-to-back pool games in the Champions Cup (kick-off 7:45pm). The 17-5 win in London last week – impressive for both how Ulster performed as well as how they adapted to the conditions – has renewed belief that the northern province can make the knockouts for the first time since 2014. It moved them back up into second in the pool, still a long way off runaway leaders La Rochelle, but a bonus point win over an understrength Quins outfit – minus big names Joe Marler, Chris Robshaw and Danny Care – would only further that belief of a place in the last eight. On paper it looks like a home banker. Ulster, without only a small handful of big names, will be expected to secure at least four tries against an already eliminated and much-changed team opposing them. Stockdale does not agree, warning: “They’re out of Europe but won’t by any means come over here and roll over and give us an easy win. They’re an incredibly spirited club and they’re an incredibly skilled club, so I think it’s going to be a tough game. Still, a place in the last eight wouldn’t go amiss for the Ulsterman, who would obviously love to see his team succeed, but also would love a crack at an elimination match for the first time in the professional game. “I’ve never got to experience knockout rugby and it’s something I’m really keen to get an opportunity to do,” he confesses. “To get to the quarter finals in Europe would be massive for us as a team and for me personally, but at the same time there’s an awful lot of rugby and we’ll have to take each week as it comes, work hard and get one win after another. It hasn’t been an easy few weeks for Ulster, and it’s no surprise that they’ve struggled without Stockdale who, as he stands up to go, reveals a tattoo of a cross on his right bicep, a reflection of his Christian faith. He also has faith that Ulster can provide him with that knockout rugby, and you can guarantee he’ll be at the forefront of that charge. Email “'You have to take everything with a pinch of salt': Stockdale keen to give the hype a wide berth ”. Feedback on “'You have to take everything with a pinch of salt': Stockdale keen to give the hype a wide berth ”.